It took about 20 minutes form start to finish - that is, adding all the ingredients to the food processor, turning on the machine, and putting into a bowl to nosh on! You will definately need a food processor of some kind. I have a Cuisinart, and you could use a high speed blender such as a Vitamix as well. Here it is - the ingredients and directions are below the pictures below. 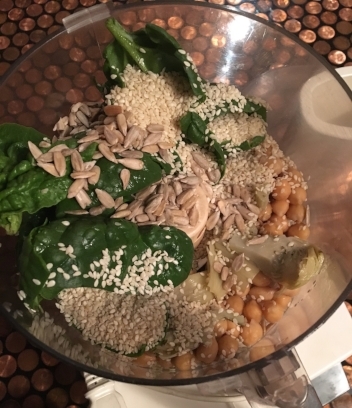 The sunflower seeds and fresh sesame seeds give the hummus a fantastic nutty flavor. If you don't feel adventurous, cut out the sunflower seeds. The sesame seeds replace the processed tahini. As you can see, one spinach leaf didn't want to join in the fun. Oh well, it was eaten right then as a tester! Eat with your favorite cut up veggies or some yummy crackers. Personally, I also like it on a peice of toast with some fresh spouts on top! But I get it if that's a bit too healthy for you. No problem man, enjoy it however it pleases YOU! Enjoy! Lisa Kai is a licensed bodywork therapist in Chicago Illinois. She specializes in transformational bodywork including Lomi Lomi and Craniosacral. This blog contains her insights on bodywork and everyday tips for practicing Aloha for the body, mind, and spirit. Lisa also practices Aloha, is a nature loving tiki freak, digs jazz, double dips her veggies, is an artist, and embraces change.